[CRITIQUE] XWA Massacre: Lojax vs. Richard Head - DEBUT MATCH! 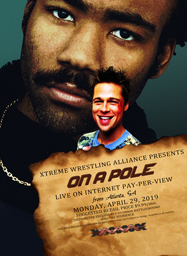 [CRITIQUE] XWA Massacre: Shade vs. Joey Jobberton - DEBUT MATCH! [VOTE] XWA Massacre MAIN EVENT: Blake Archer vs. Angelica Vaughn - WORLD TV TITLE! XWA Massacre: Albion Gale vs. Rob Chapman - ONE ON ONE! [CRiTIQUE] XWA Massacre: Ace Acid vs. Freddy McManus - RETURN OF A LEGEND! [CRITIQUE] XWA Massacre: A.J. Morales vs. Lil Rainbow Washington - OPENING MATCH! XWA Massacre #34: Guy Wants Prizes. Where? Here. Chicago. XWA Massacre: Jason Ryan vs. Rupert Von Hammerstrap - DEBUT MATCH! XWA Massacre: Miles/Kagome vs. Ainley/Johnson - TAG TEAM ACTION!